When it comes to graduation tassels, we know you want the best products at the lowest prices. Here at Honors Graduation, we strive to give our customers exactly that. Our red and royal blue graduation tassels are the perfect finishing touch for any student's graduation garb, and you simply cannot beat prices like ours! Plus, with our amazing flat rate shipping, you can count on your cords to arrive on time and at very little cost! Graduation tassels are worn by placing the loop of the tassel around the button in the center of a traditional graduation cap. The tassel then drapes over the front left side of the cap, until the students are asked to turn the tassel to the right side, signifying their great step forward in their education. Some schools do start with the tassel on the right side and turn it to the left, so be sure to ask your school administrators for specific instructions on where to place your tassel at the beginning of the commencement ceremony. 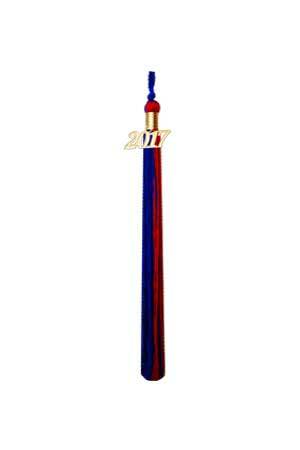 The red and royal blue graduation tassel symbolizes both the passion and the patience involved in getting an education. Students who have exemplified these traits and gone above and beyond what is expected may be asked to don this specially colored tassel so that they can be recognized for their great achievements. Some schools may use red and royal blue tassels for the entire graduating class, either because of the symbolism of the colors, or simply because red and royal blue are the colors of the school. However they are incorporated, the red and royal blue honor tassel is an excellent addition to any graduation exercises, and can inspire feelings of hope, school spirit, and excitement for the future. Be sure to ask us about our bulk order discount, and order your red and royal blue graduation tassels today!